I’ve been away, and I’ll be gone again; it’s busy season, after all, for those who live by the school year. But the soundtrack of our lives is everpresent, and today, I’m thinking about Fall: the way the leaves turn first on the trees with sickness; how the papers pile up, drowning the better self I became in summer. And then, out of the ether, the bittersweet autumnal comes through in a delicate new minor-key Creedence cover from fave nufolk duo Arborea, channelling my frustrations into focus. I renew my gratefulness for the sun, and turn towards it. I remember what music is for. And here we are. We have a special affection for bands that rise to fame through coverage here at Cover Lay Down. 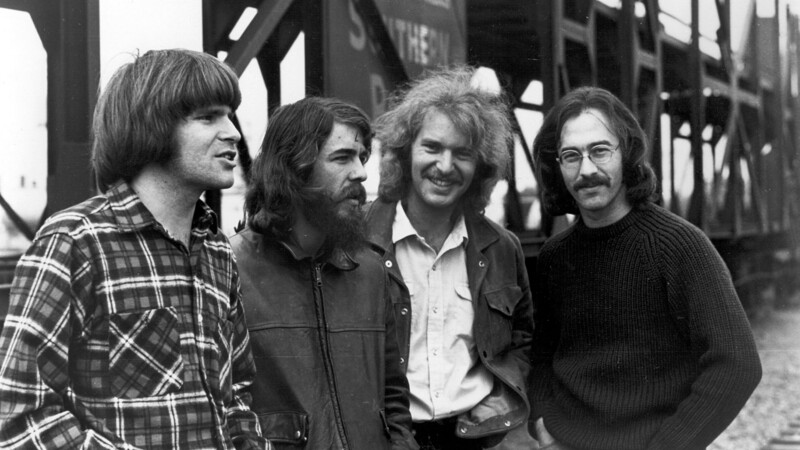 And Creedence Clearwater Revival, whose first top 40 single was their 1968 recording of rockabilly singer Dale Hawkins’ Susie Q, and whose later covers of Motown hit I Heard It Through The Grapevine and traditional gospel song The Midnight Special charted as well, certainly fits the bill. But to mistake CCR as a cover band is to miss the forest for the trees. Although CCR continued to cover and reinterpret blues, soul, and rock and roll standards throughout their career, the band truly made its name with their original songs, many of which hit the number 2 spot on the charts in the late sixties and early seventies, though none made it to number 1. These, in turn, came through the pen of composer and lyricist John Fogerty, whose knack for expressing the challenges and chagrins of his time through the band’s signature “swamp rock” musical style and a vivid politically-charged working-class narrative would ultimately fuel a solo career greatly dependent upon these older protest songs. That CCR is remembered so well reveals a surprisingly strong legacy for such a short-lived band: after all, the young foursome, who had first begun playing together in junior high school, ultimately released and recorded just 7 studio albums in a high-density career before breaking up in 1972, just four years after the release of their self-titled debut. But there’s no denying that their subsequent hits run rampant through modern culture, serving as staples of classic rock radio and as cinematic touchstones for the heady emotions of the Vietnam era. And so it has come to pass that both Creedence and its songbook represent a time and place in US culture that is ripe for both repetition and interpretation as long as war, poverty, and other issues of social justice remain at the forefront of our national conversation. Interpretation is broad: stripped of its signature sound, the Creedence canon is flexible, indeed. Our favorite covers of the Creedence Clearwater Revival songbook range from weary to wanton, from torchsong to tirade, from delicate to divine. Join us in the listening room today as we explore the myriad ways artists in the folk, roots, bluegrass, altcountry and indie world have made these songs their own.